The late 1960s and early 1970s were heady times in more ways than one. Duke University campus was very much in the midst of the Woodstock era, and doubly so, the Duke radio station, WDBS. It provided the soundtrack for the unfolding scene, debuting the music which has since become iconic for the era. But the period from about 1969 to 1972 were also a particularly active one for the station, which went from a campus-restricted AM station (first 560, then 1600 AM) with antennas wired into the dorms on both campuses, to a full-power commercial FM station, in one of the more unusual arrangements in college radio at the time. This was guided almost exclusively by a group of remarkably creative and ambitious students who all happened to arrive from different parts of the country to the Bivins Building on East Campus at about the same time: Jim Maher, Evans Wetmore, Warren Pittman, Jim Davis, Chris Santy Bob Conroy, Ken Ross, Scott Lynch, the late Mark Schenley and many others, along with some of my own involvment, as production manager (1970-71), program director (1971-72) and chief engineer (1972). While the music of the day was the station's focus, WDBS was a great creative outlet for original satire and comedy spots produced by the staff. Led mainly by "Gandalf the Great" Maher, Wetmore and Pittman, with contributions from myself, Sid "Nick O'Neal" Mills and others, Proctor and Buddah (named after one of Jim Maher's alter egos, the mobster-type Frank Buddah), the Wellington Raphelaytor, Magellan Gasoline, and various comedy spots were a regular part of the fare, mixing in with the real commercials for such business as the Record Bar, and the Jack Rabbit Laundry. I was inspired to put together this set when, because of professional commitments -- I still work in Public Radio -- I was unable to to make my Duke 30th anniversary reunion in 2002. Since one of the things I do professionally is CD mastering and sonic restoration, and since I remain an inveterate pack-rat, saving all the old tapes, it seemed only natural for me to go to work and gather what I had. It turned out to be quite a treasure trove. The tapes proved to be in remarkably good shape. Those of us who do sonic restoration know that much of the recording tape manufactured during the 1970s has broken down chemically with time. Other than repairing some splices, the WDBS tapes are almost as good as new. Going to work with my early-1960s vintage Ampex 351 (which in the WDBS tradition was extensively modified with my own electronics), then using contemporary digital tools for noise reduction, filling in dropouts, etc., I came up with what you have, much of which has probably not been heard in over 30 years. It's a fun slice of life at the time, and I think a testiment to the staff's creativity that much of it holds up as well as it does. If memory serves me (bear in mind that was around 1969) the Wellington Raphelaytor was the creation of Jim Maher, who drove a tiny and troublesome Fiat Spyder, which always seemed to need one part or another. "Gandalf" talked about needing a raffelator, then came up with the Wellington, which first made an appearance in one of the "Captain Goodguy" episodes in the fall of 1969. After Jim and others had started making the gag spots, I think I was the one who suggested that we make a series of commercials for the Wellington Raphelaytor (as we spelled it). I made the first one (on a day when I was sounding rather hoarse), then Evans, Jim and Warren ran with it, creating a classic series of series of spots, introducing a series of recurring characters and "lore" such as Otis Crabwell and the Denby Super Chauvinist racing car, and showing great creativity in sound effect design. Megellan Gasoline was a kind of followup to that. I believe that Warren came up with the concept, and again a series ensued. This was in the pre-oil crisis days when gasoline was 27 cents a gallon, and oil companies were all trying to get you to buy their brand. The rest of the spots need little explanation. There are some mini masterpieces in there. Written and produced by the WDBS staff: 1969-1972. Credits given, as much as I can recollect on the web pages. Compiled, restored and re-mastered by George Graham in 2002. Photography: Jeff Miller and George Graham (1969-1970). 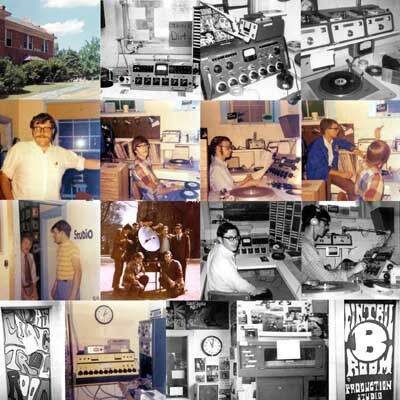 Photo captions of booklet back page, top row: The Bivins Building, On-air console 1969, Production studio console, Turntable and cart machines in the on-air studio. Third row: Mark Schenley and Mark Newell, West Campus Eclipse Coverage, Jeff Miller on air, Sid "Nick O'Neal" Mills. Bottom Row: Control room door paint job, Newsroom with WDBS-built console and good old Magnecord PT6, Middle Studio with posters looking into on-air control room, Otto the automation, Production Studio Door paint job. This page last updated [an error occurred while processing this directive]. Content and Design (c) 2011 George D. Graham.